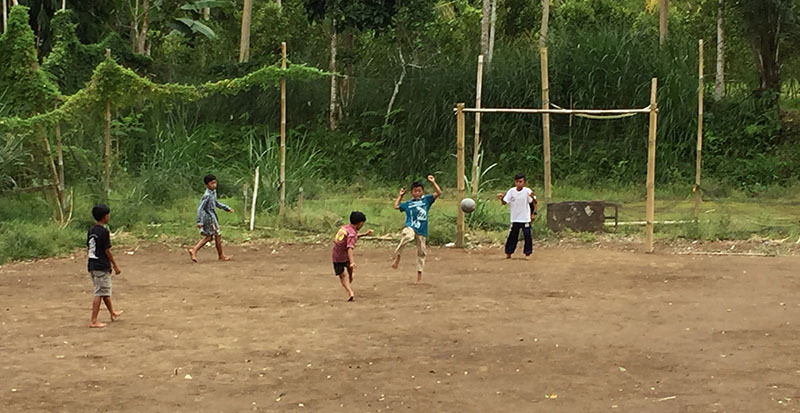 We found a hidden gem during our recent stay in Ubud – how could we have walked right past this so many times before! 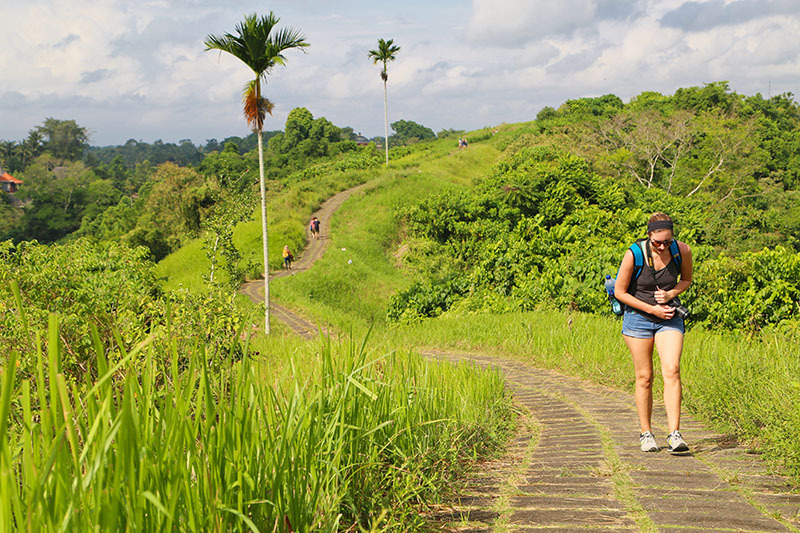 A gem that should be in Tripadvisor’s top 10 things to do in Ubud – it’s in our top 5! 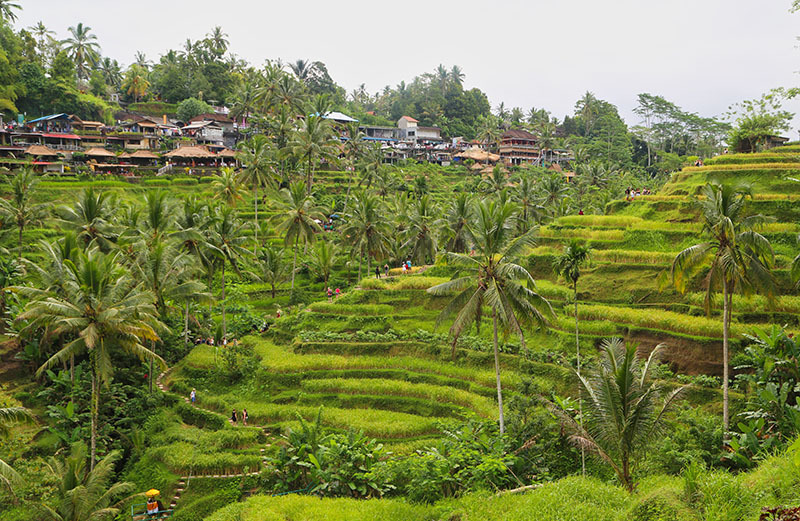 Up in the hills with rice terraces and rainforests, Ubud is a fun, vibrant and beautiful place to visit. The monkeys at monkey forest are about as close as most people will ever get to monkeys, and seeing them in their natural environment is so much more satisfying than any zoo we’ve been. 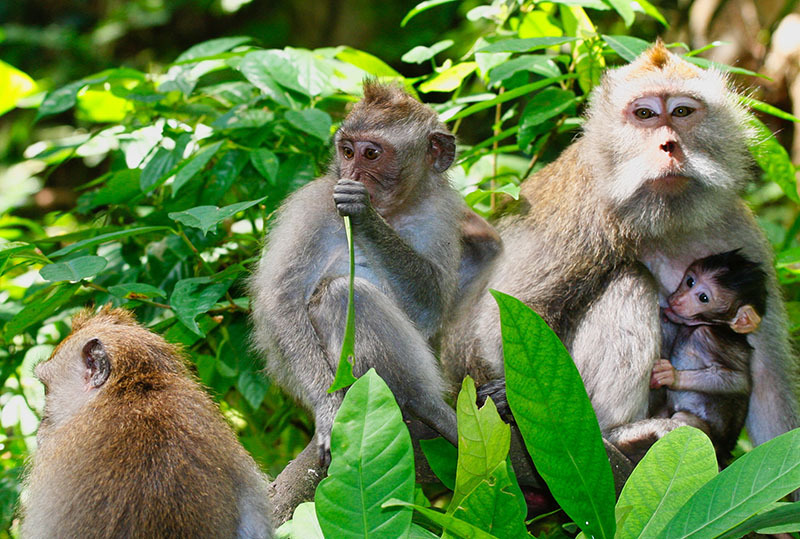 Of course, they’re smart enough to stick around this small area of Monkey Forest where visitors feed them daily, so not 100% a natural experience. But close. The markets are good for bargaining and in the 3 times we’ve visited, we’ve never gone up to the second floor, so there’s more to see next time. We chose a hotel near the main street of Ubud on our most recent visit, and walked a lot. Being there on the cusp of the rainy-season (we were there in May) meant many of the days were super steamy, so I would recommend getting a scooter or a driver. Traffic is ever busier, and worst from around 1pm to 6pm along the few main roads. So Bisma Eight was our hotel of choice, close to the shops, restaurants and cafes but far enough to get a bit of walk each day. Check out our review for more information about the hotel and all it’s rainforest glory. Let me tell you about our hidden gem find…. We had walked up and down Jl. 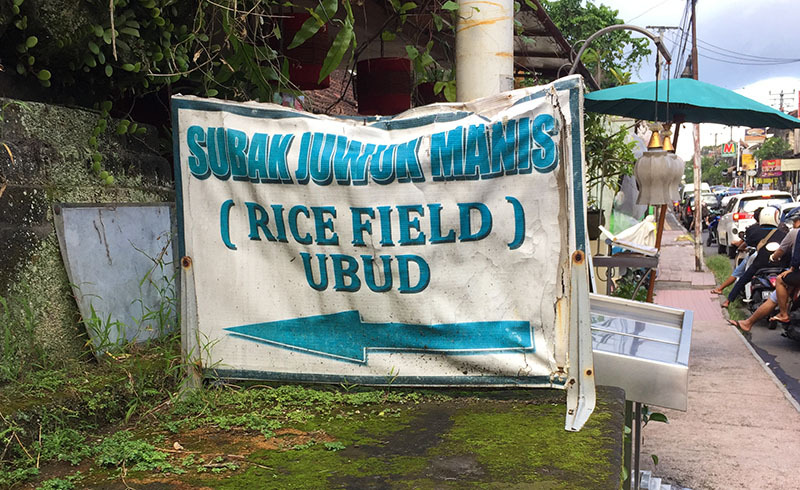 Raya Ubud, a long street in the heart of Ubud shopping area, but never noticed a sign that would lead us to a gorgeous ricefield, right in the middle of Ubud shops. Find the restaurant called Betelnut – it’s right across the street from there. 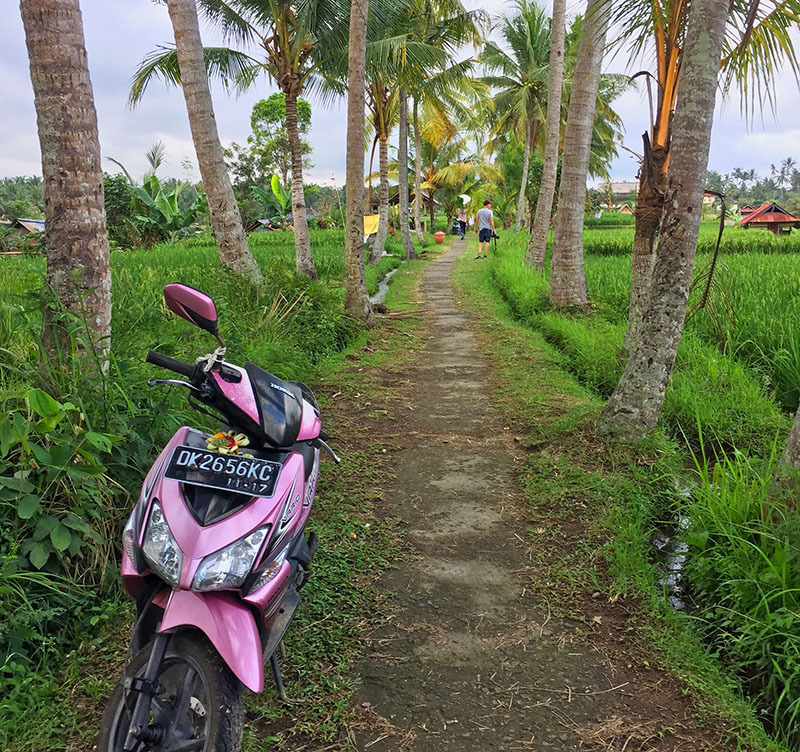 It’s called Ubud Kajeng Rice Fields Walk and after our fun discovery, we found more about it on Tripadvisor (click the link to read about it). We still think it should be in the top 10 things to do in Ubud. It’s free, it’s centrally located, and it’s stunningly beautiful and serene. Other days we visited Ubud Market and had some fun haggling with happy stall owners for the best prices between us. We bought lots of jewelery (earrings, rings, bracelets and pendants), and some sarongs. Hot tip: if you plan on buying a few things at the market and want to get the best price – see if you can buy multiple items from one stall. This way, you get a better price per unit. Our advice is to always treat the vendors with respect and don’t try to overdo your bargaining. The Balinese are generous people who do what they can to make their living, and their incomes are on average incredibly low. Give a little in the deal and you’ll both be happy. 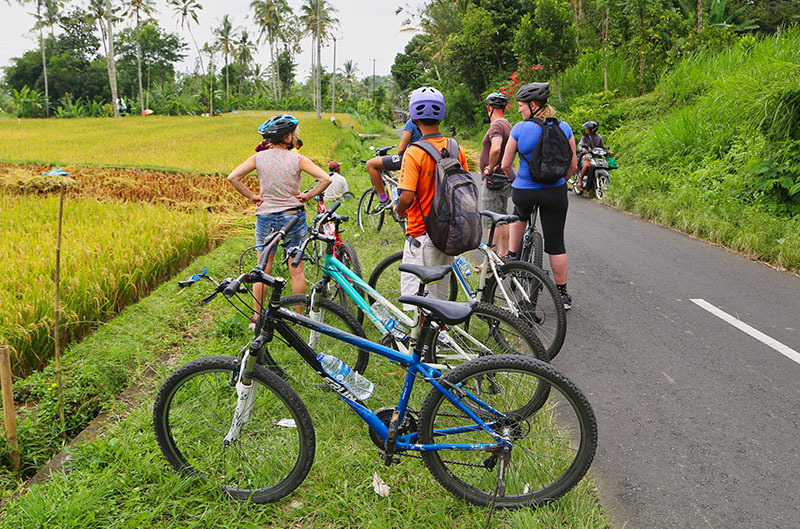 Probably the most fun we had while in Ubud, was when we took a bicycle tour down the mountain. We chose Bali Rocky’s downhill mountain cycling tour and we were rewarded with a fantastic day. Starting with a 7-seater car picking us up at our hotel at 9am, we were taken to our starting point with another 6 cyclists. The journey up gave us time to acquaint ourselves with our team, and we chatted about our experiences to date and our countries of origin. First stop was a coffee plantation in an eco environment. We sat on long tables and were each given 12 teas and coffees to try, plus some local breakfast treats. 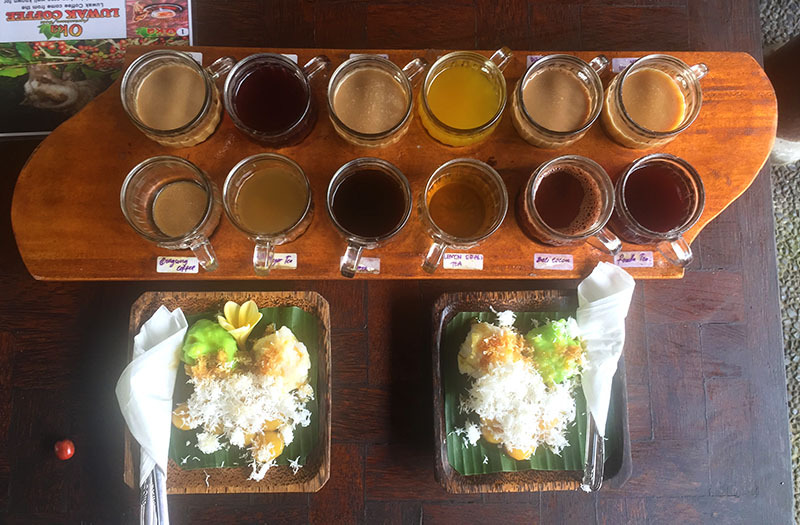 The Balinese tend to add coconut sugar or honey to many of their drinks, so some of these were a little sweet for us, but we enjoyed sampling each. About Lewak Coffee (Kopi Lewak), the most expensive coffee in the world…. We were shown the poo of a Civet, also referred to as a Lewak, that had recently consumed coffee beans. The poo was totally filled with whole coffee beans. The process goes that the civet eats the skin of the coffee beans and poops out the whole, skinned bean. We were immediately dubious about the ethics of this coffee production. A civet is an omnivorous mammal, similar to a mongoose, so we can’t understand why they would eat just coffee bean skins unless they were given no option. We saw one in a small cage and I suspect they’re all kept in cages (even though the coffee websites selling the hugely expensive produce report they are wild and free) and fed only coffee beans. We try to be conscious of doing no harm when we travel so in this case we decided against the “when in Rome ” justification and declined purchasing or trying this coffee. Actually, although we didn’t discuss it, no one at our table chose to purchase or try the Kopi Lewak. The onto our starting point we drove. Once there, a number of bikes were waiting for us and for tour groups following us. We chose the bikes that suited us best, adjusted our seats, put on our helmets and off we soared! Down the gently sloping mountain, we glided passed some of the best views of Bali. Quiet country streets, with rice fields on either sides, old farmers with sickles trekking from field to field, and old women carrying heavy loads on their heads. Their wrinkles were as deep as the incredible natural beauty of this area – an area of green as far as the eye can see. The road was quiet, with the occasional scooter passing by. Many times, we saw boys as young as 8 or 9 riding the scooters, and at one stage we saw 4 young boys all piled on a scooter together, happy smiles on their faces. We stopped to see a temple, but my attention was taken by the soccer game across the road. 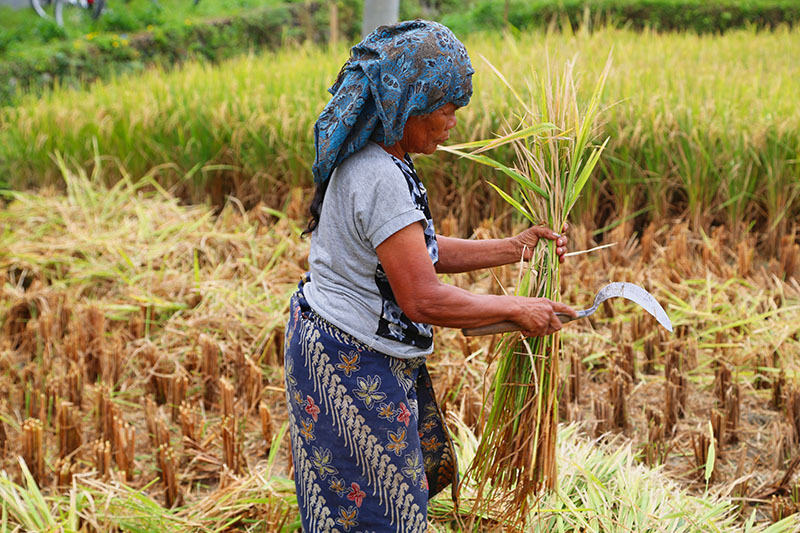 We pulled over to the side of the road to watch basmati rice being harvested by some local women. It’s backbreaking work in the heat of the day. Then some more gliding down the hill, barely touching our peddles other than to rest our feet, took us past houses and into a village. Children sat on rooftops, and in doorways, waving and greeting us with cheery hello’s. We smiled and waved, so happy to be there on that day, in that moment, in the hills of that gorgeous country with it’s kids outside and curious. We marveled at the richness of their lives and their connection to their environment. It felt good to be seen, and to see them back. A couple of hills ensued, and it was at that time that I realised that my bike really only seemed to have 2 gears, despite the 10 it was supposed to offer. Riding up the hills was a chore because I couldn’t get a gear low enough and had to peddle twice as fast as the rest of my group. So I’d suggest checking this out when choosing your bike. For some reason I chose one of the older looking bikes, which was a mistake. Nevertheless, with a face redder than a London double-decker, I survived and conquered the few short hills and we all arrived at our final destination for lunch. Lunch was tasty, local food, and there was plenty of it, and plenty of cold water and cold face washes to cool us down. Then on conclusion of lunch, we were driven back to our hotels. 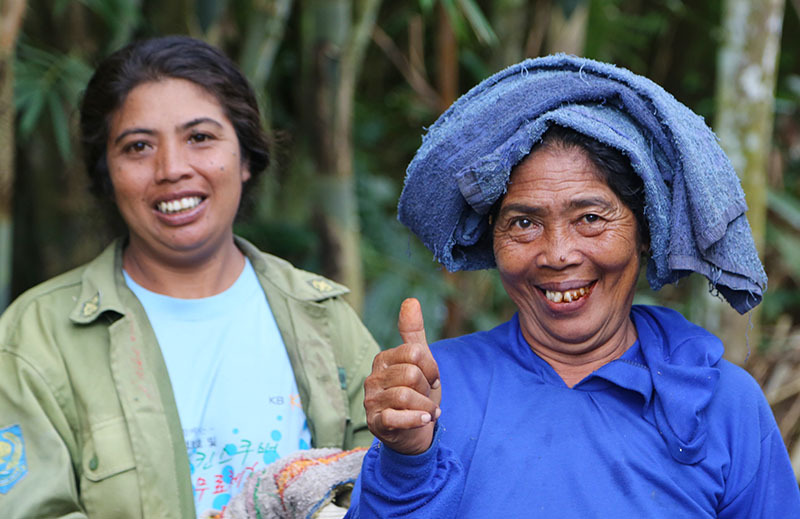 This is a wonderful tour, which we both enjoyed and highly recommend to anyone visiting Ubud. We decided we needed to visit the famous Tegallalang Rice Terraces just up the road by car from Ubud. This place is famed for it’s amazing photos – it must be one of the most photographed rice terraces in the world! When we went, it was raining, which meant a lot of mud. A lot of mud! And while climbing up the terraces wasn’t too difficult, climbing down was treacherous!!! The beauty of the terraced rice paddies brings hundreds of tourists a day, and with it, trade is offered on them. Like the little rest stops where you can buy fresh drinking coconuts, and the ‘farmers’ who offer themselves as the subject of your photo, and then put their hands out for payment once you’ve taken the shot. All a bit of fun. This lovely lady and her daughter smiled for our camera. Our last word on Ubud, is that we think of this place as a retreat – a place where you can find your peace. Laze around a pool, read a book, do some yoga, eat some healthy veg and fruit, visit the warungs and taste the local foods, and spend time breathing in the mountain air, listening to the rainforest, and just drifting. We find this place revitalising and we are always grateful to return.